SardarBuksh is that quintessential desi coffee spot we’ve all been waiting for. 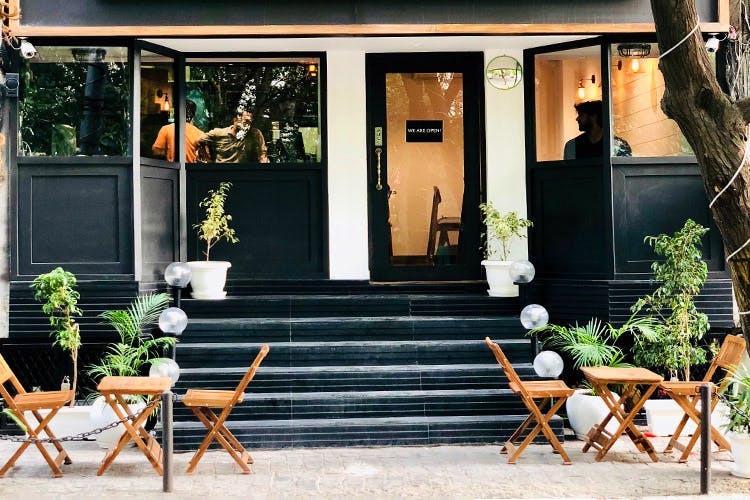 They’ve just opened up their first outlet in South Delhi, and they’re serving delicious java, the best peri peri fries, a burger that’ll set your mouth on fire, and more. Let’s just go right ahead and say you can’t go wrong ordering anything here. We tried a bunch of stuff, and everything was legitimately delightful. Our top picks, though? The peri peri fries (which are the perfect amount of spicy), the Pangebaaz burger (that’s got one of the hottest sauces ever—we actually sweat while we were eating it), and the Pesto-Cito chicken sandwich. As for the beverages, their classic Iced Latte is absolutely delicious, and the Oreo Berry shake is all things refreshing. Don’t forget to try their Oreo Lava—it’s the kind of decadent dessert sweet dreams are made of. They’ve got a lot more options on the menu—hot coffee, frappe, a nitro coffee made with nitrogen (wow?) and iced tea. The outlet looks super pretty, too, with small wooden chairs and tables outside alongside potted plants—all your Insta needs fulfilled. Head over to SardarBuksh in Hauz Khas to get your daily caffeine fix and great food! Not For The Faint-Hearted - Burger With The Spiciest Chilli In the World!